TOM MILLER has enlightened and entertained audiences at major book fairs, universities, and writers' conferences with his lively talks about his books and the many places his journeys have taken him. To arrange for Tom Miller to speak at your event, click here to inquire about available dates. 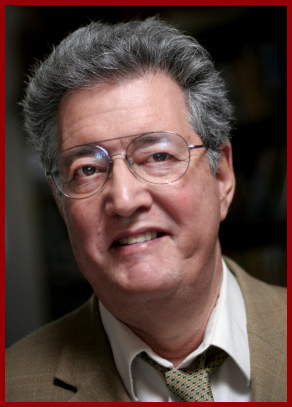 panelist, "Tom Miller, Hot and Cold"
2600 E Tacoma St, Sierra Vista, Ariz.
* Saturday 12th 11:30 a.m.
* Saturday 12th 2:30 p.m. Sat. 11 a.m. – 1 p.m.
Panel: "110 in the shade: Writing about the Southwest"
215 E. Goodwin St., Prescott, Ariz.
Fidel has died; long live Cuba’s music, books, and movies! Tom receives the Nobel Prize in Literature! Copper miners, Hollywoodlings, and songwriters, barflies, cockfighters, and eco-saboteurs all have their say. There’s a portrait of Cochise County, Arizona, closer to Mexico than to the United States but obeying the laws of neither, and we learn about the author’s escapades as a stringer for the New York Times. ROTS lovingly portrays this conflicted region with a clear moral vision, while reveling in the joys of the land and its people. The book draws on the frightening story of a double homicide, in which a majestic 125 year old saguaro kills its assassin. “Part reportage, part travelogue, and all pleasure; it is written with enthusiasm and wit… filled with lively anecdotes, pungent asides, vivid scenes... a pleasure on every page of the journey." "Reminiscent of a masterly story by B. Traven...a thorough and entertaining job." Thornton Wilder’s secret life in Douglas, Ariz.
Click here to listen to a 3-part oral history interview with Tom conducted in 2018 covering his youth, his life in Tucson, his politics, books, and his career in general. The annual New Mexico-Arizona book competition took place during the autumn of 2018, with some 56 categories available to authors and publishers in the two-state region. 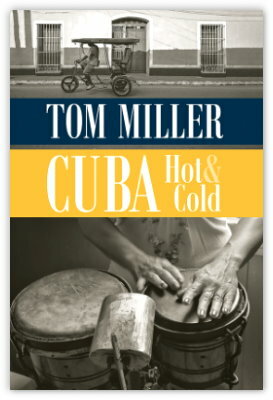 Tom’s book, Cuba, Hot & Cold, was a first place winner in the “Travel” category. Admirers of Tom's writing have assembled a 63 page Festschrift (literary tribute) praising his journalistic style and approach. Conceived and edited by Tucsonan David Carter, the Festschrift was released in November 2017 at a meeting of the Tucson Literary Club. It is available for perusing at the U of Arizona library's Special Collection room. The booklet contains fifteen essays from seven cities. Photos of Tom at work covering the U.S.-Mexico border in the 1970s are included. The literary agency Trident Media has completed negotiations for Tom’s new book, Cuba, Hot and Cold. The book, which covers Miller’s experiences during the Special Period – Cuba’s economic free-fall in the ‘90s – is scheduled for release fall 2017. 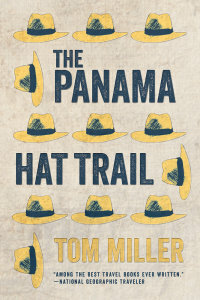 Miller’s classic travel book, The Panama Hat Trail, will be re-released simultaneously. Both will be published by the University of Arizona Press. The Cultural Ministry of Mexico has selected Revenge of the Saguaro: Portraits of America’s Southwestern Frontier, by Tom Miller, to be translated into Spanish. Miller’s book, published in English by Cinco Puntos Press of El Paso, was entered in a 2016 competition called “Programa de Apoyo a la Traducción (PROTRAD),” and will be published by Trilce Ediciones of Mexico City. Christina Guerrero Harmon will translate the book. 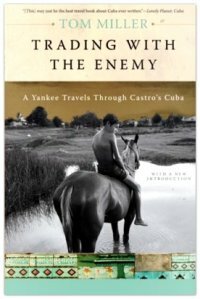 Miller’s other books include The Panama Hat Trail and Trading with the Enemy: A Yankee Travels through Castro’s Cuba. A scholarly journal in China has published an essay about Tom's book, Trading with the Enemy. The essay, published in both Chinese and English, came out in 2015. click here for a bilingual version. The organizers of the annual Mikel Essery Travel Writing Contest in San Sebastian/Donostia hosted Tom at the end of his 2011 research trip to Spain. Tom has been privileged to appear in "Mambo Poa," the contest’s journal of winning entries, in its first two issues. The research trip was partially underwritten by the Club España of Tucson and Casa Vicente Spanish Restaurant. Word has reached us that Tom has won first prize in the coveted Solas Awards for 2010. The Solas Awards judges gave Tom the Gold award in the “Destinations” category for “A Border Rat in the Twilight Zone,” originally published in The Washington Post in February, 2009. He also won a Bronze award for “Notes on an Andean Pilgrim” in the “Travel Memoir” field. The prizes are administered by Travelers’ Tales, a publisher of travel stories. Spain’s Castilla-La Mancha regional government explains Tom’s activities during the summer of 2009: Click here. For his "constant and energetic support" of the yearly Patagonia (Ariz.)Writers Roundup, on Valentine's Day 2009 Tom received the first annual Ann Caston Award from the Friends of the Patagonia (Ariz.) Library. May 30, 2008, Tom Miller was honored in a ceremony in the Centro Histórico of Quito, with a proclamation designating him a Huésped Ilustre de Quito (Illustrious Guest of Quito) for his literary contribution to Ecuador, especially The Panama Hat Trail. The proclamation, a handsome 11”x16” certificate with a blood-red ribbon running down its side under the elaborate Quito city seal, was signed by the mayor. Tom Miller has been writing about Latin America and the American Southwest for more than thirty years, bringing us extraordinary stories of ordinary people. Miller’s highly acclaimed adventure books include The Panama Hat Trail about South America, On the Border, an account of his travels along the U.S.-Mexico frontier, Trading With the Enemy, which takes readers on his journeys through Cuba, and, about the American Southwest, Revenge of the Saguaro. Additionally, he has edited three compilations, How I Learned English, Travelers’ Tales Cuba, and Writing on the Edge: A Borderlands Reader. Miller, a veteran of the underground press of the 1960s, was subpoenaed by the Nixon Justice Department to testify before a federal grand jury investigating the anti-war movement. Miller refused to even enter the grand jury room, claiming that to appear behind closed doors would affect his ability to gather news. After considerable legal maneuvering on both sides a US District Court judge ruled in Miller’s favor. Miller has appeared in Smithsonian, The New Yorker, LIFE, The New York Times, Natural History, and many other publications. He wrote the introduction to Best Travel Writing – 2005, and has led educational tours through Cuba for the National Geographic Society and other organizations. His collection of some eighty versions of “La Bamba” led to his Rhino Records release, “The Best of La Bamba.” His book On the Border has been optioned by Productvision for a theatrical film. Miller was born and raised in Washington, D.C., attended college in Ohio, and since 1969 has lived in Arizona 65 miles north of the Mexican border. He is a past fellow of the Gilder Lehrman Institute of American History and holds membership in the Thornton Wilder Society and the Cervantes Society of America. He was a major contributor to the four-volume Encyclopedia Latina. Well-traveled through the Americas, Miller has taught writing workshops in four countries and his books have been published in Europe and Latin America as well as the United States. In recognition of his work the University of Arizona Library has acquired Miller’s archives and mounted a major exhibit of the author’s papers. He has been affiliated with that school’s Latin American Area Center since 1990, and makes his home in Tucson with his wife Regla Albarrán. 14055 N. Del Webb Blvd.